At the time of the taking of the 1901 Census, William was residing at 5 Kent road, Swindon, Wiltshire, England, along with his mother and brothers and sisters. His registration details at the Church of England School, King William Street Swindon, lists his last school at Clarence Street, Swindon. 21st March 1913. He left School to work at the Great Western Railway, Swindon, Wiltshire, England. The School admission records show that Arthur, Percy and William Courtenay Willcock registered at the King William Street Church of England School Swindon, Wiltshire, England. This documents also states their previous school being Clarence Street, Swindon. It also gives their residential, address, dates of birth, dates leaving the school and to what occupation they went to. Arthur, Percy and William Willcock enrolled at the church of England School, King William Street Swindon, Wiltshire, England on 19 April 1909. This document lists their enrollment date, Names, Parents name, residential Address, Date of Birth, previous school attended, attendance records, date leaving the school and reason for leaving. His registration at details at the King William Street Church of England School, Swindon, Wiltshire England, shows his residential address as 12 Swindon Road, Swindon, Wiltshire, England. Left School to work at the Great Western Railway (GWR) Swindon, Wiltshire, England. On the day that the 1939 Register was taken William and Irene Wilcock (n. Smith)were residing at 6 Limes Avenue, Swindon, Wiltshire, England. At the time of the taking of the 1939 Register William and Irene Willcock were residing at 76 Limes Ave, Swindon, Wiltshire, England. Their occupations were listed as William - Metal Machinist Oxy Jet Cutter Heavy Worker and Irene Domestic Duties. On the day of the taking of the 1939 Register, William and Irene Willcock were residing at 76 Limes Avenue, Swindon, Wiltshire, England. Deaths registered in April, May and June 1957 - William Courtney Willcock. William C Willcock and Irene F Smith married 4th Quarter 1927 at Swindon, Wiltshire, England. [S359] British Army WWI Pension Records 1914-1920, 03 (Reliability: 3), 15 Sep 1914.
see British Military Service Record Charles William Willcock page 3 Particulars of children. [S392] National School Admission Registers & Log-Books 1870-1914, findmypast (Reliability: 3), 19 Apr 1909. [S474] St Marks, Swindon, Wiltshire, England, Parish Records, 53 (Reliability: 3), 21 May 1899. See attached copy of St Marks Church, Swindon, Wiltshire, England, Baptism Register, 1899, page 53, Baptism number 420. William Courtney Wilcock. 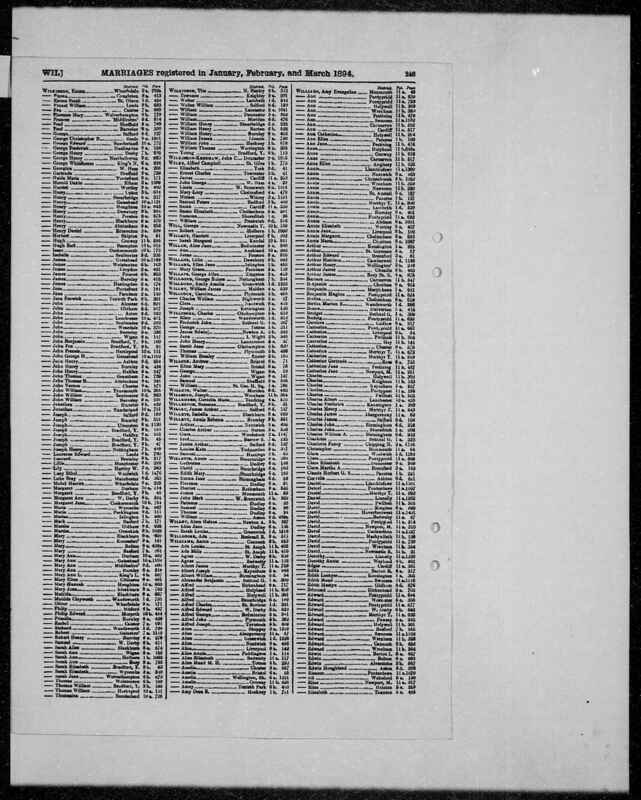 [S238] UK Census On Line (Reliability: 3), 1901. [S47] 1901 Census of England and Wales, The National Archives, England (Reliability: 3), 31 Mar 1901. See attached copy of 1901 Census of England and Wales. See attached copy and transcription of National School Admission Registers & Log-books 1870-1914. [S68] 1911 Census of England and Wales (Reliability: 2), 1911. [S344] Findmypast (Reliability: 3), 29 Sep 1939. [S397] England and Wales Deaths 1837 - 2007, Swindon, Vol 7C, page 503 (Reliability: 3), 1957. William Courtney Willcock\'s death was registered in the 2nd Quarter 1957 at Swindon, Wiltshire, England, Vol 7C, page 503. [S357] England & Wales Marriages 1837-2008, Findmypast, Vol 5A, Page 34 (Reliability: 3), 1927. See attached Transcription and Copy of Marriage Registration of William Courtenay Willcock and Irene F Smith.